There’s a simple, low cost solution. Yesterday, we whined about the high and increasing number of nuisance calls – most using robocall technology. 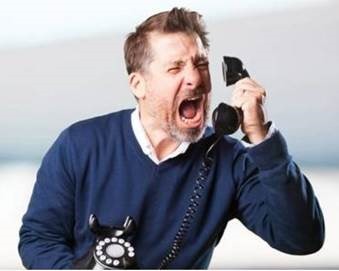 According to YouMail – a company that tracks robocall activity – Americans are now getting almost 3.5 billion (with a “b”) robocalls each month … “equaling roughly 10.4 calls per person affected”. What to do besides yelling at the phone? (1) The perps operate with impunity. They don’t care about laws and regulations. They know that they’re more likely to be struck by lightning than caught and fined or jailed for nuisance calling. (3) The perps exploit cheap technology. Calls cost fraction of pennies. The ROI is high because there isn’t much “I”. Lots of unanswered calls and hang-ups? No problem. Just keep dialing until somebody picks-up. (4) The perps capitalize on our psychological weaknesses and behavioral tendencies. When the phone rings, it snaps you to attention, right? Even if the caller ID reads “unknown” there’s a natural curiosity. Nobody wants to be rude to a caller, right? There are devices and apps try to maintain an active list of suspect phone numbers … some ID’ed by crowdsourced reporting … some flagged using fancy algorithms, e.g. high frequency of unanswered or very short phone calls. First, if you still don’t have caller ID, get it! DON’T ANSWER THE PHONE ! Let the call go to voicemail. Anybody calling for a legit reason should leave a message. If they don’t, the call wasn’t important and urgent … or more likely, the caller was a robot. If a legit caller leaves a voicemail, it’ll only take you a few seconds to listen or call them back. You’ve validated that they reached an active number and a live person. That makes your phone number more valuable on the robo-phone lists … and, will likely be sold to other robo-callers. What to do if you do pick-up? You don’t have to be polite to an automated message or a boiler room caller. But, don’t waste your time screaming at the caller … they’re used to rejection and your threat to report them has zero impact. And, don’t stay on the line until the end so that you can ‘press 9’ to be taken off their list. First, they’re not going to do that. At best, they’ll just spoof another number when they call you again (and again). Second, you’ve given them even more information: they found an active number with a live person who’s willing to stay on the line for a couple of minutes. Go through your unidentified calls and block the numbers. You’ll still get plenty of nuisance calls, but at least you’ll feel like you’ve done your part. This entry was posted on June 8, 2018 at 6:59 am and is filed under Privacy, Robocalls. You can follow any responses to this entry through the RSS 2.0 feed. You can leave a response, or trackback from your own site. Another thing: real-person phone spammers use robo-callers to screen live people. If you answer a call and say “hello” (or anything, really), the computer running the robo-call knows you’re a live one, and connects you to the spammer. If after a few seconds (count to 5 or 10) nobody on the other end says anything, you can with a clear conscience hang up on the computer. Trust me, it won’t hold a grudge… yet.